In this textbook you will discover how you can get started and succeed in the exciting business of craft brewing. When you order, you will be sent both the 2014 e-book version of this textbook and the latest print version by mail. The print version is a 2-in-1 print book and CD-ROM set, which includes sample checklists, forms, contract, and more. We recommend that you use the current e-book version of this textbook for the Brewery Owner Certificate Course. 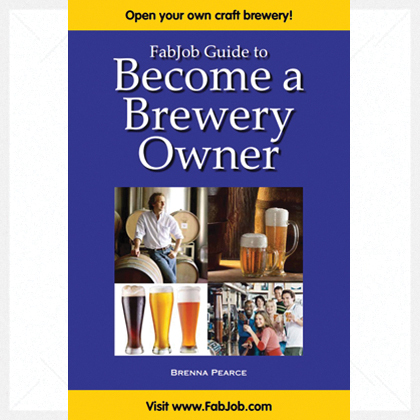 *To get this textbook for free in e-book format, register for the Brewery Owner Certificate Course. $29.97 U.S. (for print and e-book) plus $5.00 for shipping and handling in North America or $10.00 for overseas. In this textbook (and through the Brewery Owner Certificate Course) you will discover how you can get started and succeed in the exciting business of craft brewing. This textbook covers topics of vital importance to anyone who wants to become a brewery owner! Ordering is fast, easy and safe. You will receive your e-book shortly after you order it. An e-book is an electronic book which you can immediately read on your computer. It includes photos and you can adjust the type size to make it as pleasant to read as possible. You can also print a copy from your own computer. You will also receive a print copy of this textbook by mail. The print version is a 2-in-1 print book and CD-ROM set, which includes sample checklists, forms, contract, and more. Please note: it is recommended that you use the current e-book version of this textbook for the Brewery Owner Certificate Course.